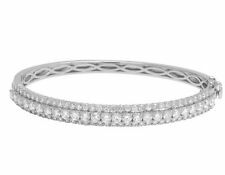 Ladies 14k White Gold Genuine Diamond Flower Bangle Bracelet .65ct 8mm 7"
Material: 9ct White Gold. BANGLE SPECS DIAMOND SPECS. Weight: 7.1g. Clarity: SI1. Shape Round Brilliant. 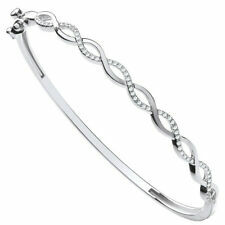 9CT HALLMARKED WHITE GOLD 7.5" ENTWINED POLISHED BANGLE. MINIMUM OF 0.33 CTS OF G COLOUR, SI1 CLARITY. IT IS ONE OF THE FINEST AND MOST RENOWNED JEWELLERY LOCATIONS IN THE WORLD. DIAMOND CLARITY: SI1. A beautiful bangle in 9k white gold with 0.50 carat of premium quality diamonds in a smooth channel setting. Diamond is also the gift for the 60th Diamond Wedding Anniversary. The April birthstone, diamond, in addition to being a symbol of everlasting love, was once thought to bring courage. The bangle features a 2.6mm, fine braided cable design adorned with 3 diamond stations. The diamonds add a very elegant and fancy touch to the design totaling exactly 0.16 carats in weight. This bangle is very easy and comfortable to wear and further it is secured with a sturdy lobster claw clasp. A beautiful bangle in 9k white gold with 1.00 carat of premium quality diamonds in a smooth channel setting. Diamond is also the gift for the 60th Diamond Wedding Anniversary. The April birthstone, diamond, in addition to being a symbol of everlasting love, was once thought to bring courage. 18ct White Gold & 0.20ct Diamonds Snake Wrap Round Bangle Bracelet. This fine 18ct white gold bangle is a serpenti style wrap round bracelet adorned with has 0.20ct. Bangle Width: 2mm. Whether a gift or a treat, this traditional piece is an essential addition to any jewellery collection. 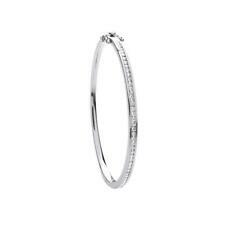 A Gorgeous & Stunning White Gold & Diamonds Set Half Circle Bangle. Diamond Weight - 0.80 carats. Set with Natural Diamonds Half Way in 4-Claw Setting. Diamond Colour - GH. Diamond Clarity - SI1. Handmade in 18K White Gold. A spectacular diamond bangle in 18k white gold with 1.00 carat of premium quality diamonds in a smooth channel setting. Diamond is also the gift for the 60th Diamond Wedding Anniversary. The April birthstone, diamond, in addition to being a symbol of everlasting love, was once thought to bring courage. A beautiful heart bangle in 9k white gold with 0.15 carat of premium quality diamonds. The April birthstone, diamond, in addition to being a symbol of everlasting love, was once thought to bring courage. Material: 9ct white gold. BANGLE SPECS DIAMOND SPECS. Clarity: SI1. A beautiful bangle in 9k white gold with 0.86 carat of premium quality diamonds. Diamond is also the gift for the 60th Diamond Wedding Anniversary. The April birthstone, diamond, in addition to being a symbol of everlasting love, was once thought to bring courage. A spectacular diamond bangle in 18k white gold with 1.15 carat of premium quality diamonds. Diamond is also the gift for the 60th Diamond Wedding Anniversary. The April birthstone, diamond, in addition to being a symbol of everlasting love, was once thought to bring courage. A beautiful bangle in 9k white gold with 0.20 carat of premium quality diamonds. Diamond is also the gift for the 60th Diamond Wedding Anniversary. The April birthstone, diamond, in addition to being a symbol of everlasting love, was once thought to bring courage. Shape: Baguette & Round. Style: Cuff Bangle. Stone Breakdown: 8RD=0.16CT, 10BG=0.29CT. Diamond Shape Baguette. Never enhanced, or lab treated. All of our gold is 100% 14K or 18K SOLID gold. Nothing less. 14 KT White Gold. Art Deco Filigree. Bangle Bracelet. Style Bangle. Diamond Color White Near Colorless HIJ. Back Side is cut open Heart design pattern. Approx 1.00 CT TW Diamond. Total Carat Weight (TCW) 1.00 CT.
(Style: Bangle. Carat Weight: 0.68 CT. Never enhanced, or lab treated. All of our gold is 100% 14K or 18K SOLID gold. Nothing less. Very competitive wholesale prices. c) No middleman. Main Stone: Diamond. (Shape: Rose/ Round. Never enhanced, or lab treated. All of our gold is 100% 14K or 18K SOLID gold. Nothing less. Very competitive wholesale prices. c) No middleman. Main Stone: Diamond. Style Bangle. (Style: Bangle. Carat Weight: 0.50 CT. Never enhanced, or lab treated. All of our gold is 100% 14K or 18K SOLID gold. Nothing less. Very competitive wholesale prices. c) No middleman. Main Stone: Diamond. 1.87ct 14k White Gold Diamond Baguette And Round Bangle With Clasp. Style: Bangle. Total Carat Weight (TCW) 1.87. Stone Shape Baguette. Main Stone Shape Baguette. Main Stone: Diamond. Never enhanced, or lab treated. Real G/Real SI1. 14K Solid White Gold. We can make any jewelry in14K Gold ,18K Gold or950 Platinum and in all colors and color combinations. All of our jewelry issolid gold. Nothing Less than the karat weight as advertised! New to our JFL collection is this popular round diamondNail Bangle Bracelet. These are all 100% genuine full cut round diamonds held between the gold mounting in a prong / pave setting, making the overall appearance larger and lustrous. This High Quality Solid 14CT White Gold Cuff Diamond Bangle Bracelet Masterpiece Will Fit Comfortably Around Her Wrist and and features 60 Sparkling Rothem Certified Real and Rare Natural Earth Mined Conflict Free D color and SI1 clarity Round Brilliant Cut Diamonds totaling 0.50 carat. We also deal in wholesale and export of 14 K,18 K Handmade and Machine made Gold Diamond Jewelry. If for any reason you are dissatisfied do first reach out to us and give us an opportunity to set things right. Gold Purity : 14k ( 58.5% Pure Hallmarked ). About Diamond. Diamond ctw : 5.43ctw. Diamond Setting : Prong. Diamond Clarity : SI2. Diamond Color : I/J. Diamond Shape : Round. 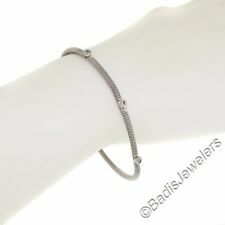 DIAMOND ARROW BRACELET 14K SOLID GOLD 0.40 CTW MODERN! THIS IS GORGEOUS MODERN ARROW BRACELET IN 14 SOLID WHITE GOLD. HIGHLY POLISHED, EACH ARROW PIECE CONTAINS 10 DIAMONDS SI1-SI2 CLARITY AND G-H COLOR ( WHITE) THE TOTAL WEIGHT OF THE DIAMONDS IS 0.40 CT. THE BRACELET IS ADJUSTABLE AND WILL FIT ALMOST ANY LADIES WRIST. THIS BRACELET IS PRE-OWNED AND IS IN A VERY GOOD CONDITION. COMES IN A BEAUTIFUL GIFT BOX. THANK YOU FOR LOOKING! PLEASE SUBSCRIBE TO MY NEWSLETTER TO GET LATEST INFORMATION ON NEW ITEMS AND FLASH SALES! (Style: Cuff. Never enhanced, or lab treated. All of our gold is 100% 14K or 18K SOLID gold. Nothing less. Main Stone: Diamond. Style Bangle. Very competitive wholesale prices. c) No middleman. 4 Prong Pave. Ladies Diamond Bracelets and Bangles. Ladies Pendants/Crosses. Diamond Bracelets. Diamond Necklaces. Style Bangle. Diamond Charms. Diamond Crosses/Jesus Pendants. Enchant the one you love with this elegant and stylish designer bangle bracelet. 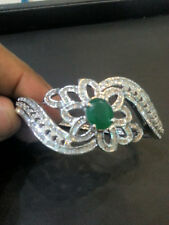 This exquisite bracelet is fashioned10K White Gold. The7MM center dazzle with five clusters of genuine diamonds attached to3MM gold bangle bracelet. Total Carat Weight (TCW) 5.80. TWO TONE CHAMPAGNE AND WHITE DIAMOND BANGLE BRACELET. Here's an amazing bracelet bangle that holds 5.80 carats. Style Bangle. Diamond Color Fancy Color and Natural White. Style: Bangle. 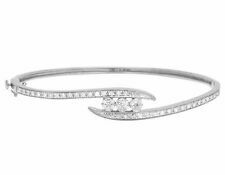 This particular bangle features a unique design with diamonds. This bangle can fit up to a 7" wrist and is13.50mm wide. Combination of chocolate brown & White diamonds. Fancy Diamond Color: Brown & White.